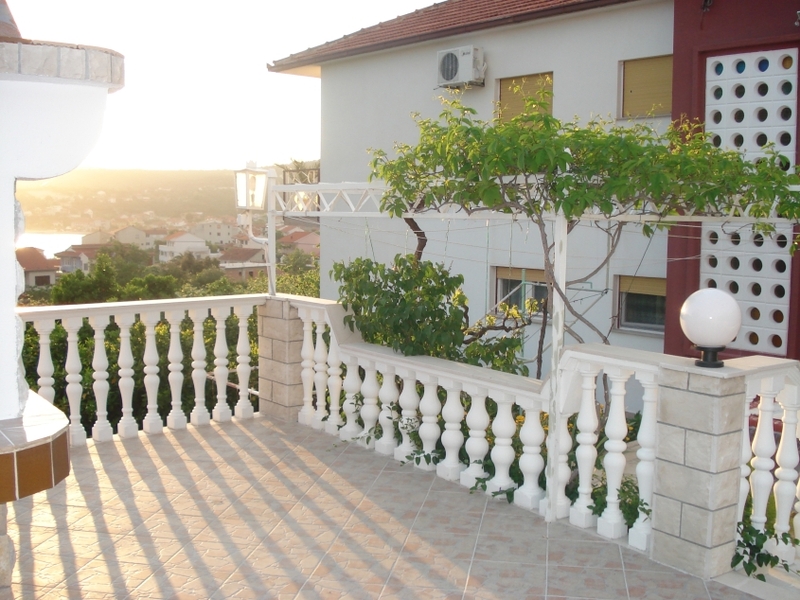 Apartments „Kostovic“ are situated in Vinisce near by UNESC-o town Trogir (18 km). Vinisce is small city with beautiful see, untached nature and mild mediteranean clime.There can be few places in the world where life is so safe for children like Vinišće.The natural goodness-both of the food provided from the land and sea-as well as the healthy climate and nature, these are riches which cannot be bought with money. Apartments are located on the first floor in family house.The owner lives in the house (with separate entrance). This apartment for (2+1)persons is 45 m2 big and it has one bedroom with double bed and sofa bed and a terrace of 8m2, bathroom with shower, bidet and window, a well equipped kitchen with sitting area and with electric cooker (2 cooking plates). Balcony lays at north-west side of house and it has beautiful sea view. Apartment for (5+3)persons is 100 m2 big and it has three bedrooms( bedroom1: with double bed and single bed, bedroom2: with double bed and 1sofa bed.Bedroom 1 and 2 has a balcony with sea view (15m2))Living room with sofa bed for 2 people.Bathroom with bathtub and window, a well equipped kitchen with sitting area and with electric cooker (2 cooking plates) and gass cooker.Kitchen has a balcony(3m2) overlooking the courtyard. Peacefull and quiet environment. Super close to the beach (on less than 5 minutes walking distance). Close to the recreational facilities. Close to the entertaining facilities. Vegetable garden in the courtyard. Fruit garden in the courtyard. Courtyard in the greenery shadow. Garden full of greenery. Fireplace at the guest’s disposal. House with its own parking space. Outdoor shower in the courtyard.Small pets are allowed on request.Boat mooring upon guest’s request 60m of apartments. Possibility of boat renting with the house owner. House owner has home-made produce. TV+SAT. Air conditioning (8Eur per day). Coffee machine. Toaster.Electric iron. Apartments are perfect for seniors, couples or families because it's located in a very calm neighborhood. During the evening you can enjoy on private balcony or on shared terrace with beautiful sea view on bay.It's a great place to get away from the hustle of the big city. If this is your first time, or millionth time, visiting Croatia, you can't find a better place to stay. I know you will have a wonderful holidays here and i look forward to being your host. Feel free to send me a message and I'll respond right away.